Disclaimer: I received products from Western Bagel for review. As always, all opinions and thoughts are my own! Happy Wednesday! I can’t believe that this is the last week in April. This month certainly went by quickly! Today I want to discuss food, more specifically, carbs! Oh carbs, how I love thee 🙂 I’m a self proclaimed carb-a-holic and make no excuses for that, but we all know there is such a thing as “too much of a good thing”. Too many carbs can equal weight gain. In addition, eating too many carbs before or during a run can have a negative impact on your running. Western Bagel to the rescue! Traditional bagels can have A LOT of calories. Western Bagels not only have less calories than regular bagels, but they have more protein and fiber as well. I received the Perfect 10, Alternative and Mini Bagelettes – All were great! The Perfect 10 bagels were yummy! With 19g of protein, 10g of fiber and only 10 net carbs, it’s the ‘perfect’ bagel if you want to enjoy carbs, without ruining your waistline! I really loved the alternative bagels. They have the same great taste and texture as traditional bagels, but each bagel only has 120 calories, 7 grams of protein and 10 grams of fiber. I made a few post-run breakfast sandwiches using the alternative bagels! The mini bagelettes were perfect as pre-run fuel. I usually cannot eat too much food before a run, so the small size was just what I needed. I toasted the bagel, but ate in plain as I have a sensitive stomach, but it would taste great with butter and jam. I ended up eating another half of a bagelette during the run as well (instead of using a gel). With Western Bagel, I’ve found a way to enjoy bagels guilt-free. 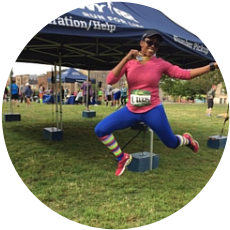 I had a great experience using their bagels for running – pre-run, during and post-run. I’m also looking forward to trying out additional recipes with these bagels, especially some of the recipes on Pinterest. If you’re interested in trying Western Bagels and want to know if they are sold near you, check out their store locator. You can also purchase the bagels online via their website. How do you use carbs for running? I love bagels (and carbs!) but I cant seem to find good bagels in Maryland so I don’t eat them very much. I love that these have all that protein, and the little ones sound like they would make a perfect snack! Being from New York, I love a good bagel, lol. I now live in Connecticut but they have great bagels too so I’m constantly tempted! You’re right, the mini bagelettes make an awesome snack in-between lunch and dinner! I cannot eat bagels anymore–I don’t have gluten issues but man! they really give me tummy issues. I’m a bagel fiend, especially during race season. It’s my go-to carb of choice. These sounds delicious! Me too! They are just so yummy! These actually look pretty awesome – I wish they came in a GF version! That’s a good idea. I wonder if that is something that they may be exploring soon?! I am going to have to admit… I REALLY DO miss bagels. MISS THEM A CRAP TON. Making gluten-free, dairy-free bagels with coconut flour just isn’t the same. NOPE. Although I have some everything bagel seasonings around the house, that I have yet to use on a recipe like this so maybe I should give THAT a shot! Awwe, I’m so sorry! I wish that there was a good GF bagel alternative! I’m all about bagels, and carbs in general. I’ll have to see whether these are available in my area. Thanks for the introduction to them. No problem at all – always happy to share information about new products. I LOVE bagels but hate how high calorie they are, so this looks like a great alternative! Apparently they don’t have them around me in Philly, too bad! Awwe, that stinks! 🙁 You can order them online from their website too! I have had these in the past and really liked them. Sadly cannot eat them now as can no longer have gluten. Oh no 🙁 Hopefully they will make a gluten free option soon. These sound awesome!! I wish they were allergy friendly. I like bagels but don’t have them in the house very often….I have not heard of this brand. I like that the calorie count is lower than others! They were really good – highly recommended! I love bagels as my pre-run snack! I wouldn’t have any guilt from eating any bagel but I do appreciate the smaller bagels as a good portion size. Agreed. The smaller bagels are the perfect portion size. Me too – they are my weakness! I love a good bagel! I will watch for these at my store! I love the mini size too- perfect! The mini size is so convenient! I need to find these! I haven’t had a bagel in forever because they are loaded with carbs. Will be clicking the link to see if they are in my area. I hope you find them in your area! Protein bagels – what a genius idea – yummy! I love bagels and very rarely eat them anymore. These look pretty good and I def would try them if they sell them near me. They are a good alternative to regular bagels. I am a New Yorker and LOVE my bagels, but, alas, they are not Weight Watchers friendly…what a treat it would be to have a bagel and cream cheese! I will try Western Bagels to not feel so deprived!